When it comes to owning tools, a general rule of thumb is that the better you maintain them the longer they will last. Vises are no exception to this rule; in fact, whether you have a traditional vise, a woodworker’s vise, or a machinist’s vise, you can significantly increase the lifespan of your tool by following a few basic steps. Nobody knows better than us that sometimes your vise gets wet during use. Whether your work piece is wet, you are working with fluids, or you just happen to spill your water bottle, vises are exposed to moisture all the time. Furthermore, sometimes they are stored in damp basements, garages, or sheds which can expose them to constant moisture and humidity. As most vises are made of cast iron or steel, they tend not to play all that well with water. 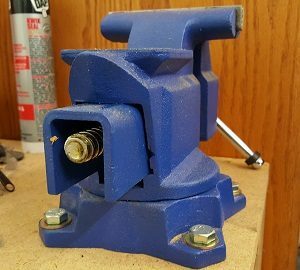 The finish can sometimes stave off corrosion for a while, but eventually the moisture will win and your vise will rust if you do not take preventative steps. Fortunately, there is an easy solution. After every time you use your bench vise, give it quick wipe down and make sure it’s dry. You can go one step further and cover your vise when not in use, which will provide lasting protection and you won’t have to worry about it. Vises are pretty simple devices, which is good as it means that maintaining them is a relatively infrequent event. However, vises contain moving parts and as such benefit significantly from occasional application of lubricant. Each vise manufacturer tends to have their own set of recommendations for exactly which lubricants match best with their tools, however the favorite tends to be dry graphite lubricant. The advantage of dry lubricant is that it staves off the accumulation of dust and grime much more effectively than wet lubricants. In spite of this, wet lubricants can also be used, although if you do opt for wet lubricants you’ll want to be diligent about covering your vise to reduce the likelihood of dirt buildup. Bench vises have a lot of flexibility in terms of how you can use them. They are outstanding for gripping square and circular work pieces. Vises with anvils can also withstand hammer blows on the anvil. Despite their intended uses, some people use them like presses to press dowel pins, apply cheater bars to the screw handles for added leverage, and perform other abusive tasks with them. Bench vises can work successfully for tasks like these, however any time you use a vise in a way that it was not designed for, you introduce some risk of shortening its lifespan. Obviously, the way to ensure that your vise lasts as long as possible is not to use it in a way that could damage it. If you must though, applying a little bit of common sense and using these techniques sparingly will better serve your vise in the long run. So there you have it! If you follow these bench vise maintenance tips, your vise is sure to last quite a long time. Even the cheapest vises can last forever if you are diligent about maintaining your tools. We hope that you have found this helpful and we hope your vise lives an extended and well maintained life!